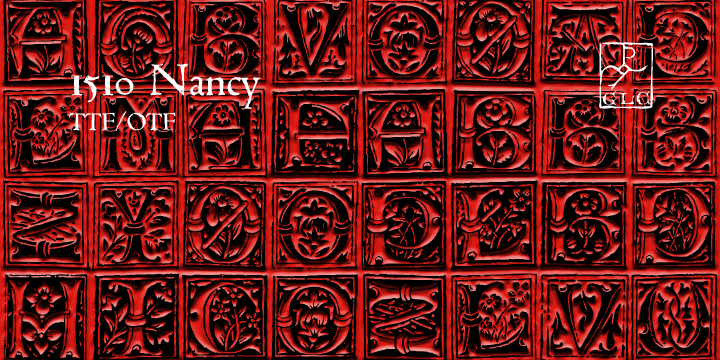 Nancy was inspired from the printing of Symphorien Champion’s book named “Recueil ou croniques des hystoires des royaulmes d’Austrasie ou France orientale[…]” in around 1510 at Nancy town of France. Basically focused on initials letters, it has 3 set of families with only 1 complete and clear. Reconstruction by GLC was bit difficult as some characters like Eth, L slash, O slash were absent and few letters had more than one representation. This is a classic example of decorative, luxurious writing, so it is used in multiple websites for Titles, Heading in presentations and also on cards.